The female kestrel has laid her fourth egg at about 3:30 p.m. on April 22nd. The normal clutch for these birds is five. Incubation will begin when the last egg is laid. This Camera is at the High Plains Environmental Center (HPEC) in Loveland, Colorado. This nest box is larger than the others we have on camera. It is built like a smaller version of our Barn Owl boxes. It will afford us a different view of the nesting cycle of these birds. We have found that when the kestrels nest within this larger box, the young are able to exercise and strengthen their wings more in this size box. The birds also remain within this size box for a few days longer than they do when in our normal-sized boxes. When they finally fledge, they are able to take longer flights that when they nest in our normal sized boxes. The female kestrel does most, if not all of the incubation, as the male hunts for his mate and the nestlings. 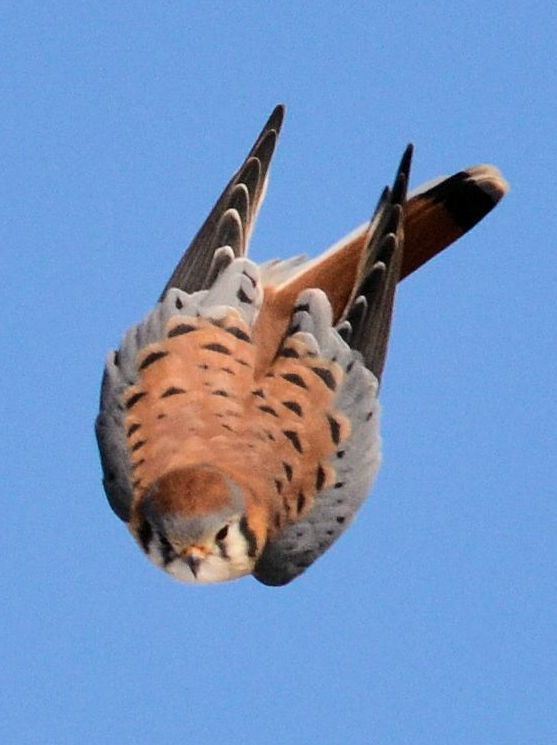 The diet of American Kestrels varies geographically. The birds nesting in our boxes, in Northern Colorado, prey upon a variety of creatures including lizards, grasshoppers, beetles, voles, mice, small snakes, and small birds.